Barton Street, a continuation of Eastgate Street, grew up outside Gloucester’s East Gate along the road on which were the bartons of manors of the Crown and Gloucester Abbey. Settlement on the further reaches of Barton Street had apparently started by the 13th century. From 1840 onwards Barton Street became increasingly built up with two- and three-storey shops and residences to serve the growing number of inhabitants in the newly-built surrounding terraced streets. Out of the community centre turn right to All Saints, begun in 1874 and consecrated in 1875. The church was designed by Sir George Gilbert Scott in the C14 style and is now the Anglo-Asian Cultural Centre. A vicarage house built in 1877 was replaced in the late 1950s by a new house in Derby Road. In 1854 the turnpike at the end of today’s Eastgate Street was moved further out by public subscription. The complex railway network of Gloucester created in the mid-19th century included level crossings in many streets, and in 1848 a railway crossing was located at what is now the wide road junction north-west of the Anglo-Asian Centre. The crossing was later known as Barton Gates and remained a considerable obstacle to traffic until demolished in the 1960s. As the local population grew, there became a need for educational and religious facilities. In 1858 the Primitive Methodists built a church in Barton Street. They moved to a much larger chapel on the other side of the road in 1882 (building now demolished). Nos 110 and 112 Barton Street (listed grade II) apparently date from the turn of the 18th century. The Bartongate Surgery building was given a major overhaul in 1989. Sinope Street may be named after a naval action in the Black Sea port of Sinope in 1853. Widden Street was laid out in 1854. Widden Street School, Gloucester’s first board school, was opened in 1878, enlarged in 1892, but was still overcrowded in the late 1890s. Nos 7 and 8 Gothic Cottages date from c.1820. Their remoteness at that time is indicated by the fact that they were used as an isolation hospital in the cholera epidemic of 1832. To go beyond the junction of Barton Street and Park Road was then regarded as ‘going into the country’. 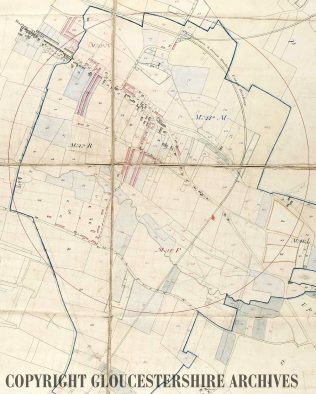 The 1886 Ordnance Survey map shows the ‘Victoria Works (Iron)’ to the north of today’s no. 147 Barton Street which perhaps accounts for the arched access to ‘backland’ buildings at the rear of the street. Millbrook Street was formerly known as Goosewhite Lane, recorded in the early 13th century, and known later as Goose Lane. Settlement was sparse until the 19th century. Goosewhite or Whitegoose mill was used as a snuff mill in 1790. Pin makers Hall and Lander used it as a wire mill in 1813. It was demolished in 1865. In 1612 Alderman Lawrence Wilshire lived in a house in Goose Lane (later Millbrook Street), which was later known as Lower Barton house; it was demolished in the 1880s. The turnpike in Goose Lane (later Millbrook Street) and Ryecroft Street began in 1843. By 1863 the Vauxhall gardens were covered in terraced housing and a terrace had already been built to face the gardens from Millbrook Street. In 1869 a voluntary school called Alington was opened on Millbrook Street but was closed again by 1878. In 1869 a wagon repair works adjoined Lower Barton house, the owner of which built the houses in Sidney Street. In 1885 Lower Barton house was demolished and Derby Road and others were laid out in its grounds. The police station near the corner of Derby Road was formerly the vicarage to All Saints church. In 1780 India House, later the India Inn, is recorded in India Road. A building at the junction by India House inn was owned by Thomas Smith a timber merchant in the 1820s, and he began the development of Barton Terrace, later the High Street. In the 1820s India Road mill used as a grinding house by Cox and Buchanan. In the C19 it was used as a corn mill known as Brown’s Mill. This ceased trading in 1910. Horse-drawn trams became part of the city’s transport system in 1879. The service along Barton Street, active in the 1880s, ran to a terminus in India Road. A roller skating rink opened in a former tramways depot in India Road in 1909. In 1887 the Co-operative Society built a depot at the east end of India Road. A resort frequented in the early 19th century was Blenheim Gardens (renamed Vauxhall Gardens in c.1832), which was located roughly on the site of today’s Blenheim Road and Vauxhall Road. It was opened in 1812 by James Kimber as a bowling green and tea garden and staged events such as balls, pigeon-shooting matches, and, in its first years, firework displays to celebrate Peninsular War victories. As the area became developed, Vauxhall Gardens were built on from 1863 but a bowling green survived behind the Vauxhall Inn until the mid 20th century. The existing Vauxhall Inn was built in 1876 by the brewers Mitchell & Butlers of Cape Hill, Birmingham. An exuberant Arts and Crafts style with Baroque details, it replaced a public house of the same name that stood on the site. 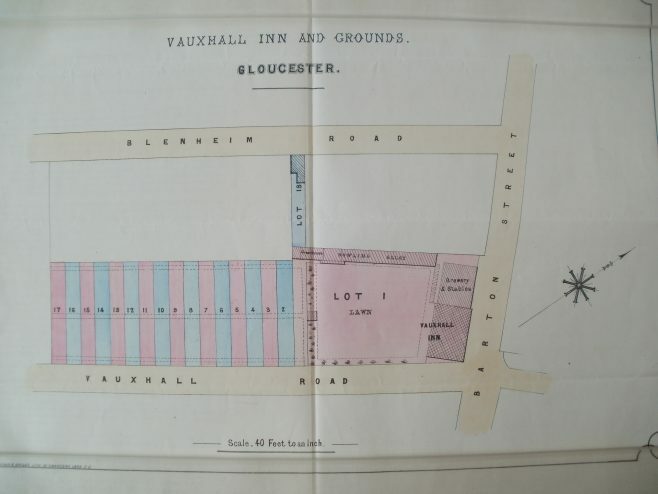 In 1859 it was described as the Vauxhall Inn and tea gardens. At one time there was a private zoo attached to the premises. The Picturedrome, later the ABC Ritz, the Ritz, and the New Olympus, was built as a 700-seat cinema on the site of three shops in Barton Street and opened in 1923. Originally owned by the Gloucester Cinema Corporation, in 1943 it was acquired by ABC who installed CinemaScope and a new canopy in 1955 and renamed it the Ritz. The cinema closed in 1962, then became a bingo hall until 1984. The Gloucester Operatic and Dramatic Society, at that time outgrowing their HQ in the Olympus Theatre in Kingsbarton Street, bought the Ritz, built a stage and a lighting box, renamed it the New Olympus and opened it in 1986 with a production of ‘Fiddler on the Roof’. Since then projection equipment has been installed and it can once again operate as a cinema between stage shows. The Prince’s Plume public house was built in 1905 – it is now part of Al Murad DIY shop (nos. 146-152 Barton Street). As Gloucester expanded in the mid 19th century, there was an ensuing growth in artisan housing. Victoria Street was one of the earliest and was laid out for terraced housing by Richard Helps in 1837 and appears on Causton’s City map of 1843. There has been a Muslim community in Gloucester since the 1950s. In 1968 Two houses in Ryecroft Street were registered for use as a prayer hall. The houses were demolished in 1981 and a larger mosque built, designed by local architect Brian Tait. The mosque was opened in 1983. The Jama Al-Karim Mosque in All Saints Road was built in 1985-6. An annual fair was established in Barton Street in 1465 by the abbot of Gloucester Abbey, to provide a more official venue for extramural trading. It was to be held on the eve, day and morrow of St. Lambert (16 – 18 September). In 1586 it was predominantly a pig and pleasure fair attracting many pedlars, gypsies and travelling showmen. In the 17th Century Barton Fair continued in private ownership to be held in September. Corn grown in Herefordshire was a main commodity and it then got shipped to Bristol, whose population doubled between 1670 and 1730. Malt and cheese were other important commodities. Barton Fair became famous for its cheese which was carted to Lechlade and Cricklade and shipped down to London. Its importance for cheese went into decline in the 1780s although three cheesemongers were still employed in the city in 1791. Two mop or hiring fairs were held on the following two Mondays in 1756. Mop fairs were held on the subsequent three Mondays in 1808. In the 1920s it attracted buyers from Wales for the sheep.